I have updated the first post on the 1932-1935 Medallion issue to correct an error that was brought to my attention by Mr. Julian Goldberg, a philatelist in Toronto. Apparently the 1c stamp which Unitrade classifies as a flat printing #195d, is actually not a flat plate printing at all, but is a dry rotary printing. Today's post takes us through the very first commemorative stamp issues of Queen Elizabeth's reign. During the first three years of her reign, the post office released six different issues, which comprised 11 stamps in total. 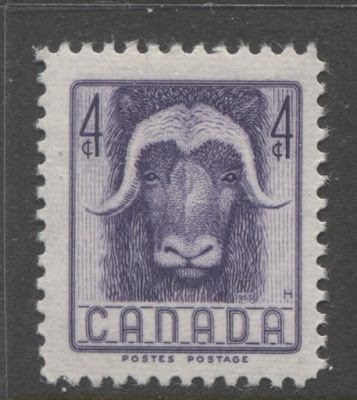 Two of these issues were a continuation of the Prime Ministers series that had begun in 1951, while a new multi-year Wildlife series was started in 1953. 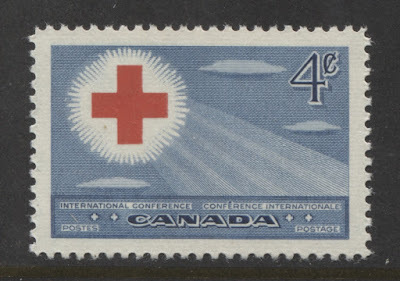 The first of these issues, the Red Cross Conference issue, which was released on July 26, 1952, was the first stamp of Canada to be produced from a printing technique other than engraving. It was produced from a combination of engraving and lithography. Another first, was that this period featured the first commemorative issue to be issued in booklet form. This issue was the 5c beaver from the 1954 Wildlife Issue, that was released on April 1, 1954.